Microprose's entry into the sub simulation ocean goes by the name of Silent Service, and this complex, but easy-to-play game is just what I expect from one of the leaders in the simulation field. After booting, you choose joystick or mouse control, and either target practice or one of the eleven scenarios. 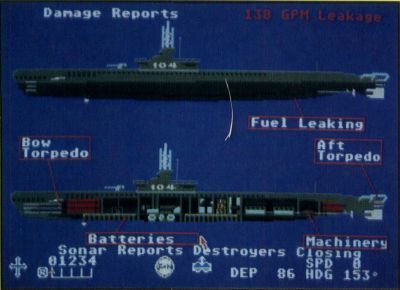 Nine difficulty levels, four skill levels and the ability to adjust seven reality levels, such as the frequency of dud torpedoes or limited visibility, further extend playability. Once all of these preliminary selections are made, it's off to war. It is at this point that the most striking feature of Silent Service becomes apparent. 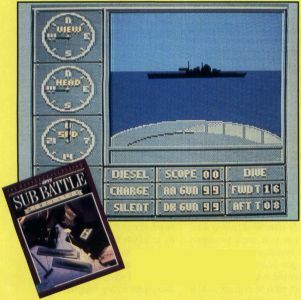 In contrast to the other simulations reviewed here, Silent Service's command interface graphically places you on the conning tower. 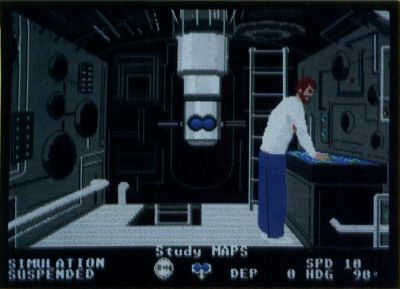 Moving the on-screen seaman about with the mouse allows you to visit the bridge or view the maps and charts, or check instruments and gauges. While it took a little while to become accustomed to, I quickly found that this type of control was both the easiest to learn and to use. The intuitive, logical location of each set of game controls allows you to concentrate on playing the game, rather than trying to learn some contrived command set. And while beginners will love this intuitive command design, experts will embrace the wide variety of additional orders possible. A special mention must also be made of the manual. Not only does it completely and concisely explain the game, utilizing a generous amount of illustrations, but it teaches as well. After reading the background on the scenarios, and the tactics and historical notes, you'll actually feel as though you are on the sub, sensing the pressure of tons of water, as well as a nervous enemy, over your head. And really, isn't that what it's all about?